Need action - Let's get James over 5000 on Twitter! My buddy James Governor from RedMonk is hovering just under the 5,000 mark on Twitter. He is currently less than 180 shy of cracking the 5K follower mark. Join me and follow James. He has a ton of great stuff to say! I have recently purchased a new vehicle with a litres per hundred kilometres active display. This monitors fuel mileage as you drive. What I noticed was both disturbing and a potential place for vast improvement in terms of how technology can help the environment. I hereby give this idea up freely to anyone wishing to pursue it further - this IP is potentially too helpful to have anyone patent it. I noticed that my vehicle on flat ground cruised along at around 5l/100km (around 55 MPG) through green lights on relatively flat ground. If I had to stop and re-start, the gauge went to 99l/100 km (about 3 MPG) to re-accelerate. After some further testing and calculations, I verified the hypothesis that starting and stopping a vehicle can account for around 80% + of the fuel used vs. flowing traffic. I drove from Whistler to North Vancouver (around 111 km) and used the same amount of gas I used to go the last 15 km through Vancouver. Other than validating a few basic laws of physics (conservation of angular momentum, bodies in motion tend to stay in motion, etc. ), this means that our governments and almost the entire industry trying to focus on getting better mileage for vehicles is basically inconsequential in comparison to better active/adaptive traffic systems. In fact, other than the move to hybrids (which the jury is still out on in terms of NET energy savings), even if you bettered the mileage of every vehicle by 50%, it would mean a 5% gain compared to a better traffic flow which could deliver potentially up to 50% better return. While it would not be possible to have green lights for everyone, there are certainly situations I have encountered where a high volume road is sometimes held up for the sake of one or two cars to utilize the right of way of an intersection. An interim step could be to replace traffic lights that meet certain thresholds with roundabouts to keep traffic from having to completely stop in all directions. Hybrid cars are also good as they rely on capturing brake energy and being able to store it as electricity then use the electricity to re-accelerate the car. IMO - these are good intermediate steps but the holy grail is in a different place. What if every vehicle had some form of transponder that could communicate its current MPG to sensors in the road as well as the road being able to sense how many cars are traveling in each direction. A grid of sensors could be used to feed an array of every vehicle on the road into a central planning computer which could optimize the traffic flow (within parameters) for the best fuel efficiency. I am an environmentalist but I am also a pragmatist. While some advocate that everyone should ride bikes and take public transit, I just don’t see the auto industry silently going away anytime soon. This means an immediate focus on improving hydrocarbon efficiency is probably still warranted IMO. This is obviously a totally unproven hypothesis however there is sufficient evidence to warrant a test simulation IMO. Even if this proved to be consequential, such a system would take decades to implement. There are other benefits as well. Now imagine that the transponder could be wired into your electronic dashboard and warn you of events on the road ahead (example - "unexpected hard braking - 100 meters ahead")? You could even have audio communications coming in to the car as instructions to the driver such as "maintain 45 KPH and you will make the next 4 stop lights. If you go faster, you will have to brake and re-accelerate". This is not some wild pipe dream. All the technology exists today. Would it be worthwhile conducting some further studies? Is anyone interested in discussing something like this at FooCamp (or somewhere else) this year (assuming I will be going again)? LiveCycle Data Services in action - all this week! If you have not yet seen the future of broadcasting, tomorrow at noon Pacific time, go to http://tracker.amgentourofcalifornia.com/ and create an account to see the live coverage of the Tour of California bike race. Today Levi Leipheimer rode like a madman and took the lead away from a breakaway group. Only Peterson was able to keep pace over the second climb and Peterson snaked by Levi for the stage lead while Levi took the overall GC. To me, this event is far superior to watch here than on TV. You can choose the cameras (sorry Mr. Producer but mashups and trusting your users are two big patterns on Web 2.0). There is a live chat. The overall GC, text updates, rider tracking, and a host of other interface options allow you, the racing fan, to be in control of what you want to see. The ad revenue model is there too - the sponsor ads stream live just like on TV. The site is built with LiveCycle Data Services feeding data to a Flex client that registers and gets data pushed out to it as data becomes available. This is the perfect 3-tier architectural use of LiveCycle Data Services. Anyone building a high-traffic RIA nowadays can no longer afford to push all the stuff on the client - you need to have an intermediate tier to aggregate and organize data for an orderly dissemination to clients in a manner consistent with the terms of service and QoS agreements. This will become more important as mobile is fed into the mix. At Whistler: Where's my high-speed Internet? At home I have the luxury of SHAW high-speed Internet. It rocks and I get speeds of up to 22,000 KBPS. Let me tell you that I really missed this at Whistler. The hotel I was in had Telus high-speed Internet - vastly overrated and not really high speed. I decided to test it out and see the results. Internet speed tests are nothing new under the sun but it still surprises me how many of them are so unusable - e.g. they need Java installed, they require changing firewall settings, or are just too complicated for such a trivial task. 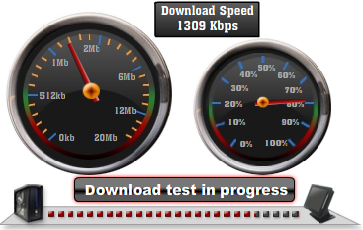 This speed test - www.broadbandspeedchecker.co.uk - originally from the UK uses Flash and can't be easier to use. Just click a button and you will get your result. Since I do a lot of my business elsewhere, I decided to try the UK-based cloud service. You can give it a try via this widget. Here are the results from my home office provider. Keep in mind this is a real world test during very busy times. Some speed tests allow you to choose the server that you want to test the speed against. This leads to inconsistency in results based on your destination. The new Broadband Speed Checker makes it really simple to use and far more consistent by utilizing Amazon CloudFront CDN where you will be tested against the fastest server available to you. Obviously, the online speed tests won't show you everything about your Internet connection - they will show the maximum speed you can achieve at a given time. The average speed you are getting through your broadband cannot be determined by online tools. If you want to monitor your speed and Internet usage on the ongoing basis then I recommend this open source bandwidth meter. 1. If you pay for high speed Internet and do not test it, you might be getting ripped off. Use this test. 2. My ISP is Shaw in Western Canada - not only do they give me consistent results that I can verify, they are also one of the few companies left that allows you to speak to a human being after two rings on the telephone. 3. How happy are you with your broadband speed? I'd like to hear some comments about good and bad ISPs. I have had good experience with mine, found Telus a train wreck and Rogers somewhere in the middle in terms of speed but with bad customer service.